Wizards of the Coast and VIZ Media have announced The Art of Magic: The Gathering: Kaladesh collection. 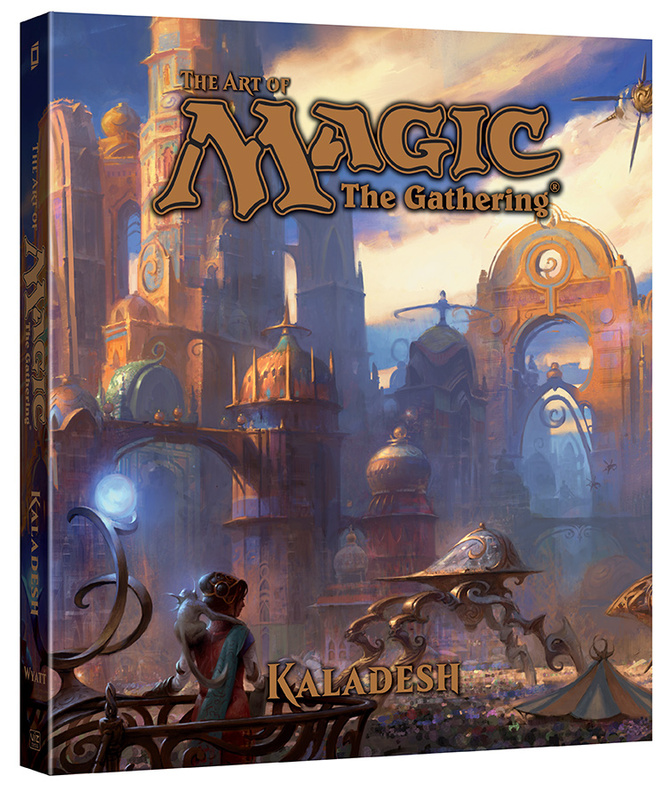 Scheduled for release in January 2017, The Art of Magic: The Gathering: Kaladesh is the third volume in VIZ Media’s ongoing series of hardcover art books presenting the incredible illustrations of Magic: The Gathering. The 240-page book will feature dozens of full color works by more than 95 artists, including Cliff Childs, Winona Wilson, Christine Choi and Adam Paquette, who also illustrated the cover, and will be complemented with additional in-depth lore by bestselling author and Magic: The Gathering Senior Game Designer, James Wyatt. Optimism, innovation, and the spirit of creativity fill these pages, lavishly illustrated with the award-winning art of Magic: The Gathering! Welcome to Kaladesh – a vibrant, beautiful plane where anything is possible. Join the heroic Planeswalkers of the Gatewatch as they explore the Inventors’ Fair, and let your imagination soar alongside thopters and airships crafted by the best artificers in the Multiverse. Come discover the marvels of Kaladesh – its inhabitants, its inventors, and its artifacts. They all await you at the grand Inventors’ Fair! Duel Art Art Book Spotlights the Original Creator of Yu-Gi-Oh! Before it became one of the world’s longest running and most popular trading card games, the Yu-Gi-Oh! franchise began as a manga by Kazuki Takahashi. Duel Art: Kazuki Takahashi Yu-Gi-Oh! Illustrations collects the stunning color artwork of the series’ original creator from throughout the property’s history. Within the prestigious hardcover book, fans will find magazine covers, card artwork, rare illustrations, and rough concepts. Readers will also be treated to creative process breakdowns, and an exclusive interview with Kazuki Takahashi-sensei himself. After 13 years in North America, Yu-Gi-Oh!’s popularity shows no signs of slowing. Any fan of the trading card game, manga, or animated series will want Duel Art: Kazuki Takahashi Yu-Gi-Oh! Illustrations in their collection. Duel Art: Kazuki Takahashi Yu-Gi-Oh! Illustrations is in stores now.